I first saw Bedep/CryptXXX from the pseudo-Darkleech campaign on Monday 2016-04-18, but I didn't realize what the ransomware was. Earlier this week, Proofpoint posted a blog about CryptXXX ransomware and how Angler EK and Bedep are being used to spread it (link). This is pretty important, since I've seen a lot of Angler EK from the pseudo-Darkleech campaign (the actors behind Reveton, according to Proofpoint). I'm guessing we'll see a lot more CryptXXX, now that pseudo-Darkleech Angler EK is pushing Bedep/CryptXXX instead of TeslaCrypt. 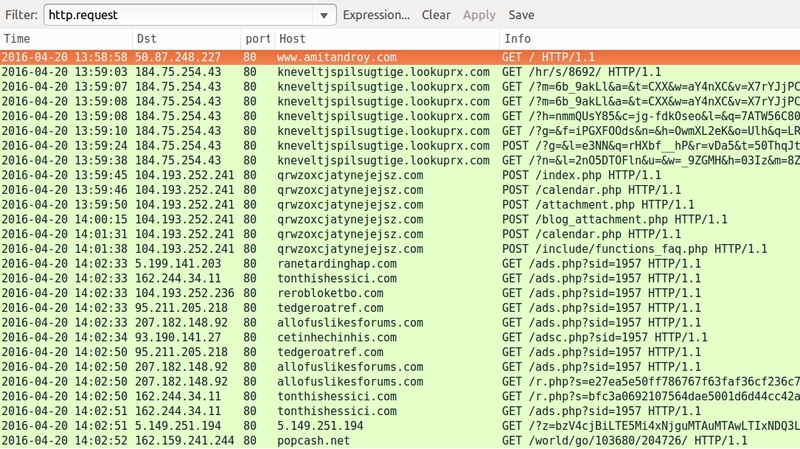 Shown above: Pcap of the 2016-04-19 traffic filtered in Wireshark. Shown above: Pcap of the 2016-04-20 traffic filtered in Wireshark -- First run. 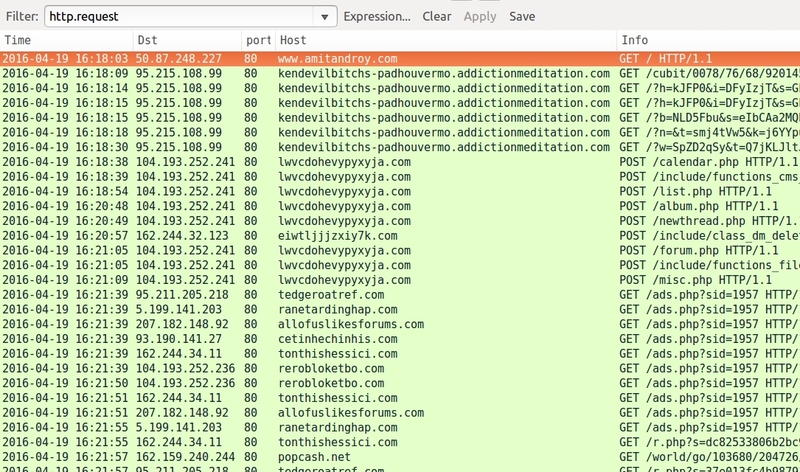 Shown above: Pcap of the 2016-04-20 traffic filtered in Wireshark -- Second run. Shown above: An example of the CryptXXX post-infection traffic on 2016-04-20. Shown above: Desktop of the infected host after the Angler EK/Bedep/CryptXXX infection on 2016-04-20. Shown above: Although the CryptXXX ransomwware deletes itself, the click-fraud malware stays resident on the system. 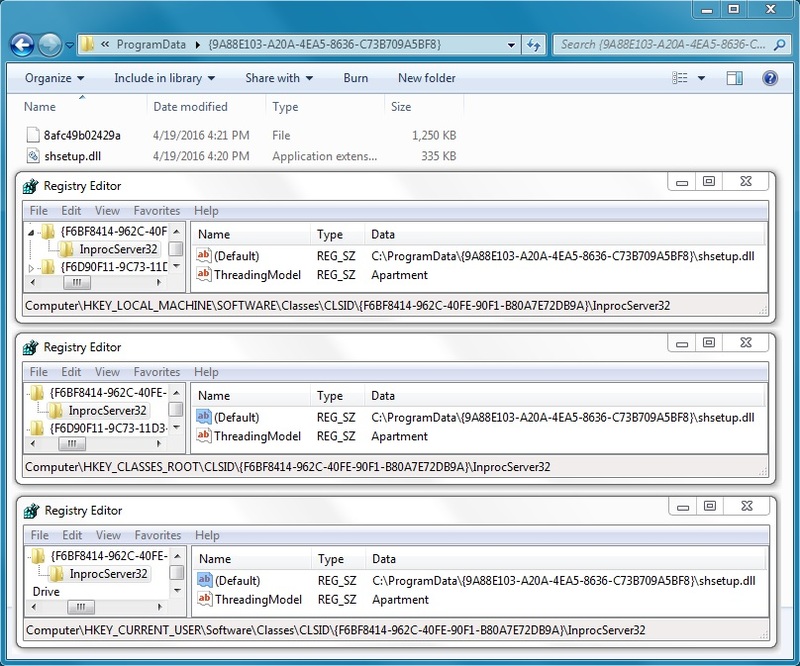 This is the click-fraud malware from 2016-04-19 and some associated registry entries.